First off, make sure to checkout my Table Top Review for the Crosman NightStalker for all the specifications and details on it. 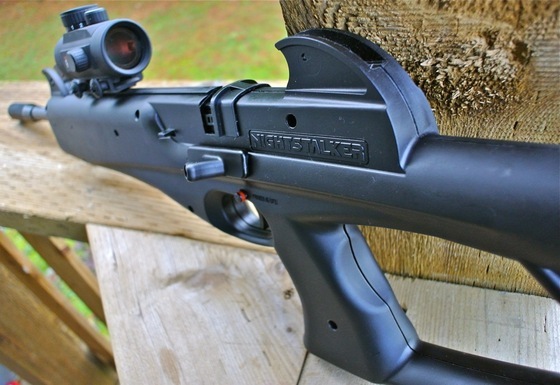 In this Filed Test Review of the Crosman NightStalker .177 caliber pellet shooting air rifle I shoot 5 rounds through the Chronograph to get a real world average FPS of this detuned Canadian version. As expected the CX4 Storm replica does not get anywhere close the 580 FPS the non-regulated version claims to get and even with fairly light 6.9 grain pellets I got an average of just over 400 FPS, also keep in mind I have re-tuned this air rifle a bit to get somewhat higher Feet Per Second performance then the stock Canadian version even if it's not a lot. Unlike the Umarex Beretta CX4 Storm I also Field Tested, the Crosman CX4 replica air rifle was not so reliable for me when it came to operation, I had several misfires and failures to load which was not what I was expecting since I had shot this gun many times before with very different results. The Crosman NightStalker uses a rotary magazine system which in theory should work pretty well but maybe due to my pellet choice this time around I found the NightStalker almost painful to shoot and I'm not sure why it was acting up so much for me? As far as recommending this gun, I think if you can get your hands on a used one you should fair pretty well as long as yours does not act up like mine was on this day and time. If you can find the higher FPS version then it would be a nice upgrade to the one I was testing. The original price point for the Crosman NightStalker was not expensive so don't pay too much if you do plan on getting one and expect to play around with pellet choice till you find one it likes best.